Conservative watchdog group Judicial Watch sued the State Department on Monday for emails, texts and instant chats with John Kerry and State Department officials and/or Kerry meetings with Iranian officials. The watchdog group filed a [Freedom of Information Act] FOIA lawsuit (Judicial Watch, Inc. v. U.S. Department of State(No. 1:19-cv-00777)) against the Department of State over former Secretary of State John Kerry’s ‘shadow diplomacy’ to salvage the “Joint Comprehensive Plan of Action (also known as JCPOA or ‘Iran nuclear deal’). Last May, it was reported by the Boston Globe that Barack Obama’s former Secretary of State, John Kerry had been secretly meeting with foreign officials to salvage Iran’s nuclear weapons program. He [John Kerry] sat down at the United Nations with Foreign Minister Javad Zarif to discuss ways of preserving the pact limiting Iran’s nuclear weapons program. It was the second time in about two months that the two had met to strategize over salvaging a deal they spent years negotiating during the Obama administration, according to a person briefed on the meetings. With the Iran deal facing its gravest threat since it was signed in 2015, Kerry has been on an aggressive yet stealthy mission to preserve it, using his deep lists of contacts gleaned during his time as the top US diplomat to try to apply pressure on the Trump administration from the outside. President Trump, who has consistently criticized the pact and campaigned in 2016 on scuttling it, faces a May 12 deadline to decide whether to continue abiding by its terms. John Kerry also reportedly met with French President Emmanuel Macron in both New York City and Paris. On May 8th, 2018, President Trump announced he was set to withdraw from Obama’s Iran nuke deal calling it one of the worst deals he’s ever witnessed. 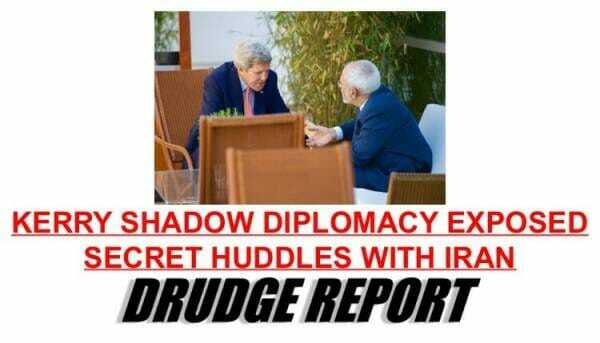 Leading up to Trump’s announcement, John Kerry, the architect of the Iran nuke deal, was reportedly behind the scenes on a “stealthy yet aggressive mission” of shadow diplomacy, desperately trying to preserve his pact with Iranian officials Javad Zarif. Iran’s foreign minister Javad Zarif abruptly announced his resignation in February of this year in an Instagram post. Barack Obama and his officials continue to undermine President Trump on the world stage without fear of reprisal. John Kerry was previously seen in Paris meeting with Iranian officials, Obama was recently in Germany secretly meeting with Chancellor Merkel and Hillary Clinton traveled to Puerto Rico in January to meet with the governor of San Juan to help rebuild infrastructure after a powerful hurricane destroyed the island. Apparently the Logan Act only applies to Republicans (General Flynn). The post Judicial Watch Sues State Department Over John Kerry’s ‘Shadow Diplomacy’ to Salvage Iran Nuke Deal appeared first on The Gateway Pundit.